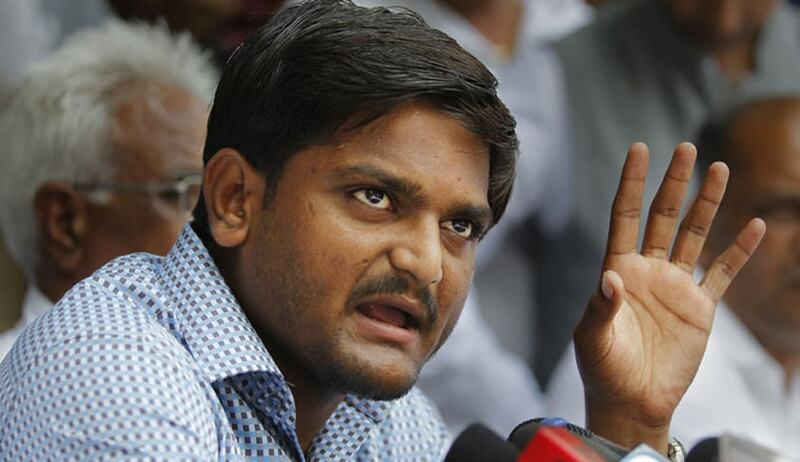 Patidhar agitation leader Hardik Patel suffered a major setback when the Supreme Court today refused him bail and asked the Gujarat police to complete probe in a sedition case against him within 45 days. A bench of Justice J S Khehar and Justice R Banumathi restrained the police from filing a chargesheet against him till the next date of hearing that is January 5. On November 4, arguing before another bench which recused from hearing the case, Sibal had said "in Karnataka, somebody said chop-off the head of the Chief Minister, sedition is not filed. In Kashmir, there are separatists who say anti-national things but sedition case is not being filed but 22-year-old Hardik is being made victim. This is a great opportunity for this court to look at the matter and see the contours of sedition", Sibal said. Invoking charges including sedition, the state police had said in its FIR that Hardik had exhorted activist Vipul Desai not to commit suicide but rather beat or kill 2-3 policemen. Referring to constitutional schemes on freedom of speech and expression, Sibal said the question is whether the alleged statement disturbed the public order or related to incitement to commit an offence. So far as the USA is concerned, various case laws suggest that the offence of sedition cannot be invoked by merely considering the word of mouth and there has to be a proximate relationship between the statement and the consequence, the senior advocate said. Sibal sought urgent hearing of Hardik's plea and said the alleged incident took place on October 3, the FIR was registered on October 18 and as a matter of fact no incident as a consequence of the statement took place. He also referred to statements by various persons and said the charge of sedition has not been invoked on them, whereas Hardik was forced to face the charge.